Henry Bryans was the son of Samuel and Rachel Bryans. Henry was born about 1893 in Caledon, County Tyrone. It is believed the family moved from Caledon to Cambrai St, Belfast sometime between 1897 and 1899. Henry worked as labourer in an iron works. Private Henry Bryans was serving with the 4th (Queen's Own) Hussars when he was killed in action on the 11 September 1914 at the First Battle of Aisne in France. Henry was 19 years old. Henry was one of 5 Bryans brothers who fought in the war. Two were killed; Henry and Frederick. Henry Bryans was the son of Samuel and Rachel Bryans. Henry was born about 1893 in Caledon, County Tyrone. It is believed the family moved from Caledon to Belfast sometime between 1897 and 1899. This is deduced from the 1901 census which tells us 4 year old David was born in Tyrone, but 2 year old Frederick was born in Belfast. The 1901 census records the family as living at 20 Cambrai Street, Shankill, Belfast. Henry was six years old. Samuel Bryans was a bricklayer. The 1911 census shows the family still lived in the same house. Henry was sixteen years old and worked as labourer in an iron works. Family: Samuel Bryans, Rachel Bryans, Sarah Bryans (born about 1884), William John Bryans (born about 1885), Samuel Bryans (born about 1889), Ann Elizabeth Bryans (born about 1891), Robert Bryans (born about 1893), Henry Bryans (born about 1895), David Bryans (born about 1897), Fredrick Bryans (born about 1899), Agnes Bryans (born about 1907). 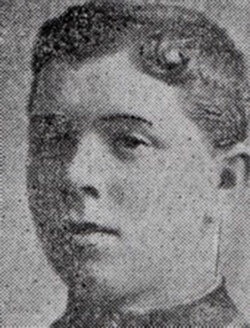 Private Henry Bryans was serving with the 4th (Queen's Own) Hussars when he was killed in action on the 11 September 1914 at the First Battle of Aisne in France, reconnoitering the bridge at Conde. There is some dispute on the actual date of death. Henry was 19 years old. A memorial service was held on the evening of 8th November 1914 at St. Matthews Church, Belfast for Harry Bryans. It was noted that "the attendance was very large, and the service was very hearty and impressive." 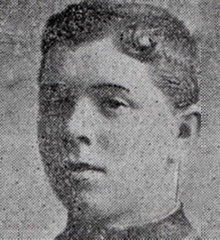 Captain Brooke, officer commanding his squadron, in writing to his parents, describes him as "a very promising young soldier and a general favourite with his comrades, who deeply deplore his loss." Private Bryans was one of the first members of our Cadet Company, and held the rank of sergeant at the time of his departure. The officers and lads of the Company join in expressing their sympathy to his family in their bereavement. Henry was one of 5 Bryans brothers who fought in the war. Two were killed; Henry and Frederick. Frederick was serving as a Rifleman with the 15th Battalion Royal Irish Rifles, 12583. He died at the age of 19 on 21 November 1917. His name is recorded on panel 10 of the Cambrai Memorial, Louverval, France Because Frederick was born in Belfast he is not included in the Dungannon War Dead.